French President Nicolas Sarkozy on Tuesday called on China to join a new global pact to halve greenhouse gas emissions by 2050 and avoid the "dramatic consequences" of global warming. 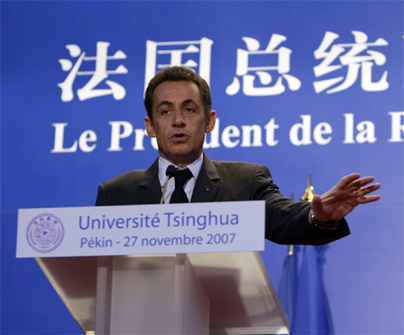 In a speech at Beijing's Tsinghua University, Sarkozy said global warming posed a major environmental threat and urged China to take the lead with France against climate change for the sake of future generations. "We are not asking you to give up your development," he told an audience of students. "Make your development an example for the world." He said the Chinese government had pledged in its 11th Five-year Plan to take necessary measures for sustainable development and the preservation of natural resources, with plans to reduce energy consumption by 20 percent by 2010. China could take the advantage of its scientific education, its planning ability as well as its power and reputation in the world. "I propose that China join a new global contract, an ecological and economic New Deal to influence immediately, profoundly and sustainably, in accordance with its size and power, the modes of production and energy consumption," he said. "Your country can make this strategic decision." Negotiations on the new pact, to succeed the UN Kyoto Protocol, will begin at a UN conference on climate change in Bali, Indonesia, next week. Sarkozy urged both developed and developing countries to shoulder their responsibility to contribute under the principles of the pact. China and France shared similar views on the relationship between man and nature, Sarkozy said. The two sides had agreed to establish bilateral consultation to employ all possible resources and technologies to protect the world environment. Sarkozy also stressed that France had employed a "decarbonized" production style, which it could share with China, that had resulted in France having Europe's lowest emissions of carbon-dioxide. A day earlier, China and France signed a joint statement on responding to climate change and the establishment of a partnership between the two countries in this regard. Sarkozy arrived in Beijing on Sunday afternoon for his first state visit to China since taking office in May.